Stains are man-made colored powders used in glazes, bodies and engobes. They are manufactured by sintering powdered components in special furnaces at high temperatures. The powdered mixtures are stoichiometric, carefully compounded, finely ground and vigorously blended so that adjacent particles react without needing to be melted. After firing the material is ground in such a way as to control the particle size within a specific range (often unique to each type of stain). Some stains are also acid-washed after grinding. These processes render them more resistant to dissolving in glaze melts or melting themselves compared to the metal oxides from which they are made (obviously if they are not washed they will be somewhat soluble in use). Different types of stains have differing levels of stability against temperature. For many colors there are a variety of stain chemistries that can produce them, each has advantages and disadvantages. Some colors, however, can only be made using one specific chemistry and/or process. Theoretically, since stains are inert any stain should develop its color well in any transparent base glaze. Unfortunately, this is not the case in actual practice. 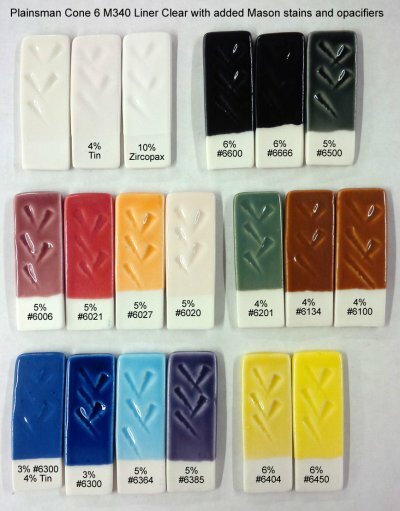 There is enough interaction with the host glaze that many stains require a specific chemistry in the host glass to develop the color. Chrome-tin pinks are an example. Stain manufacturers classify the idiosyncrasies of the colors they produce and document the cautions of each class. 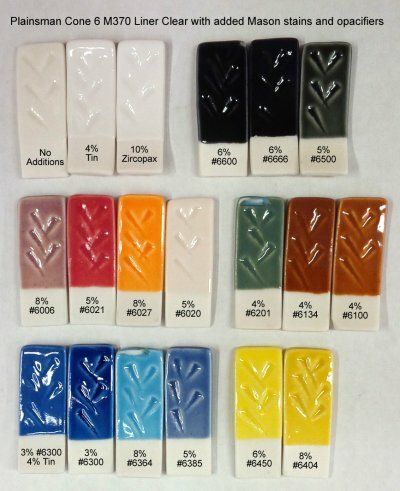 In this way glaze, underglaze and overglaze manufacturers can tune their products to work. It is important to realize that stains are not to be employed pure. They are used in-glaze, as a percentage. This can be as little as 1 or 2% in some applications, but more commonly would be much more. A common mistake is using pure stains as an under or over glaze. Since they are relatively refractory, if you spray stains on pure and put glaze over that, the glaze cannot bond. It is like painting a dirty car. The stains have to be mixed with a melt medium that envelops the particles and bonds with the body below and glaze above. But the medium must not melt too much or colors will bleed into the over or under lying glaze. The medium also needs a hardener so it dries durable enough to handle. If the consistency is a liquid (rather than paste) it also needs a suspender so particles do not settle out in the slurry. Each stain needs a medium that will not be hostile to its color development, that means you cannot use a one-medium-fits-all-stains approach. Also, some stains melt more and some less, so the medium needs to take this into account. A melt flow test should be done to fine tune the flow of each (see link below). Stain product brand names can be confusing. This happens when one company buys another and continues to support the product names and numbers of the former company. As an example, the German Degussa company spun off its ceramic color business as Cerdec in 1993. They later bought Drakenfeld Colors (of Washington, PA). In 2001 Ferro USA bought Cerdec. So that means that any stain labelled as any of these three companies is actually a Ferro product now. 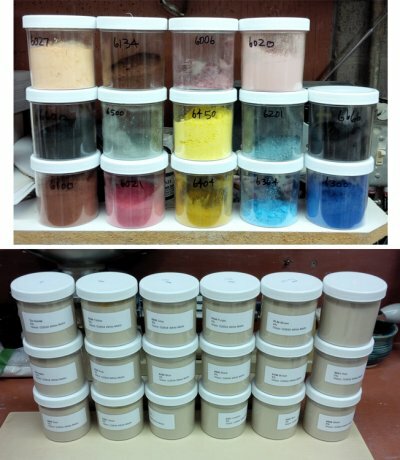 A quick and organized method of testing many different stains in a base glaze: Prepare your work area like this. Measure the water content of the base glaze as a percent (weight, dry it, weight it again: %=wet-dry/wet*100). Apply labels to the jars (bottom) showing the host glaze name, stain number and percentage added. Counterbalance a jar on the scale, fill it to the desired depth, note the amount of glaze and calculate the weight of dry powder that is present in the jar (from the above %). For each jar (bottom) multiply the percent of stain needed by the dry glaze weight / 100. Then weigh that and add to the jar and put the lid back on. Let them sit for a while, then shake and mix each (I use an Oster kitchen mixer). Then dip the samples, write the needed info on them and fire. These are Mason stains added to the cone 6 G2934 silky MgO matte liner base glaze (with tin, zircopax and various stains added). The brightest colors (6600, 6350, 6300, 6021, 6404) were tested overnight in lemon juice without visible changes. It is known that MgO mattes are less prone to acid attack that CaO mattes. Caution is required with inclusion stains (like #6021), if they are rated to cone 8 they may already begin bubbling at cone 6 is some host glazes. All of these Mason stains make the porcelain more refractory, but some more so (e.g. 6385, 6226). Some do not develop the intended color (e.g. 6006 pink). Some need a higher concentration (e.g. 6121, 6385). Some need a lower concentration (e.g. 6134). Some do not impart a homogeneous color (e.g. 6385). 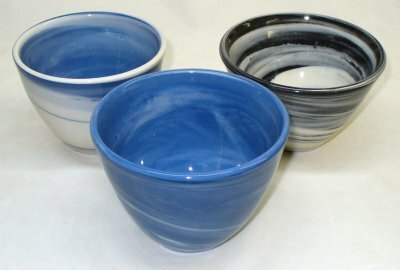 These bowls were made by Tony Hansen using a mixture of white and stained New-Zealand-kaolin-based porcelain (Plainsman Polar Ice) fired at cone 6. The body is not only white, but very translucent. 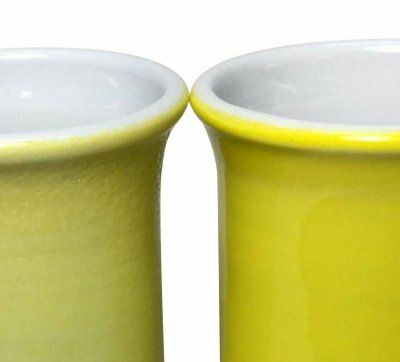 What happens when you opacify a colored glaze? 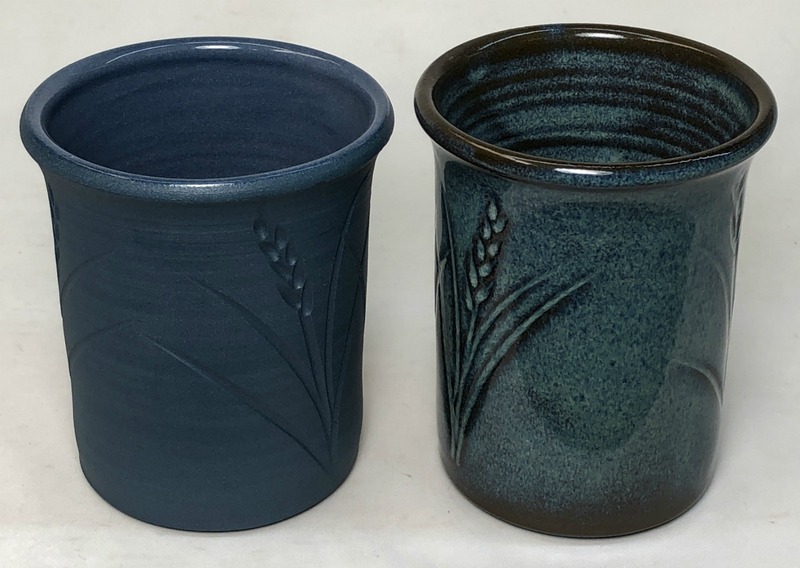 Left: G2934 cone 6 matte glaze with 3% Mason 6300 blue stain. Right: An additional 4% tin added. Notice how an opacified color does not have depth and therefore is lighter in color. Also it does not break to different shades at the edges of contours the way the transparent color does. Two stains. 4 colors. Will the guilty oxide please step forward. We are looking at two pairs of samples, they demonstrate why knowing about glaze chemistry can be so important. Both pairs are the same glazes: G2934 cone 6 matte and G2916F cone 6 glossy. The left pair has 5% maroon stain added, the right pair 5% purple stain. 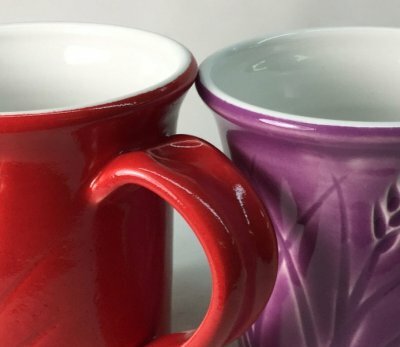 The red and purple develop correctly in the glossy but not the matte. Why? 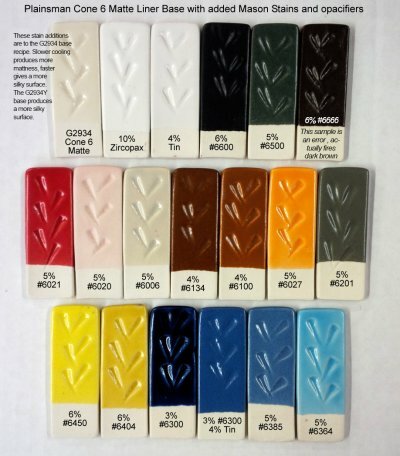 The Mason Colorworks reference guide has the same precaution for both stains: the host glaze must be zincless and have 6.7-8.4% CaO (this is a little unclear, it is actually expressing a minimum, the more the CaO the better). The left-most samples of each pair here have 11% CaO, the right-most have 9%. So there is enough CaO. The problem is MgO (it is the mechanism of the matteness in the left two), it impedes the development of both colors. When you talk to tech support at any stain company they need to know the chemistry of your glaze to help. 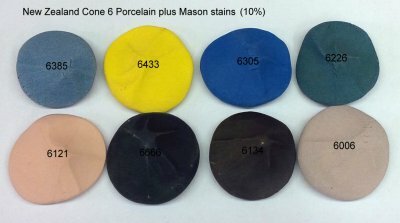 These are Mason stains added to cone 6 G2916F clear liner base glaze. 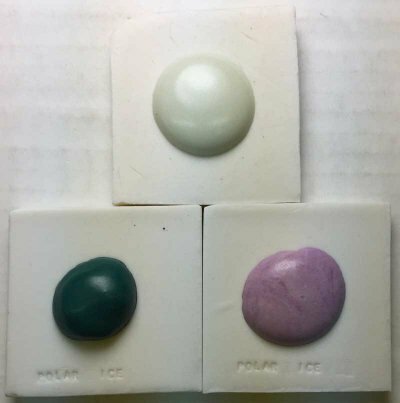 Notice that all of these stains develop the correct colors with this base (except for manganese alumina pink 6020). However caution is required with inclusion stains (like #6021), if they are rated to cone 8 they may already begin bubbling at cone 6 is some host glazes. These are Mason stains added to cone 6 G2926B clear liner base glaze. Notice that the chrome tin maroon 6006 does not develop as well as the G2916F glossy base recipe. The 6020 manganese alumina pink is also not developing. Caution is required with inclusion stains (like #6021), if they are rated to cone 8 they may already begin bubbling at cone 6 is some host glazes. 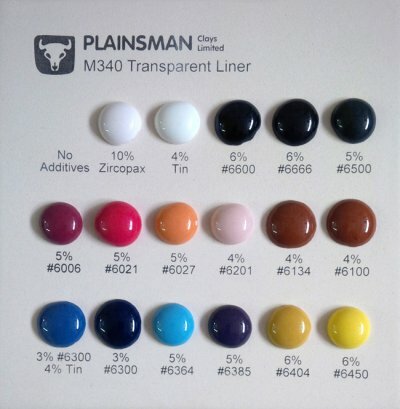 Plainsman M340 Transparent liner with various stains added (cone 6). These bubbles were fired on a bed of alumina powder, so they flattened more freely according to melt flow. You can see which stains flux the glaze more by which bubbles have flattened more. The deep blue and browns have flowed the most, the manganese alumina pink the least. This knowledge could be applied when mixing these glazes, compensating the degree of melt of the host accordingly. Two different shipments of a cobalt free black stain. Why different colors? This is not actually bad, it is good. 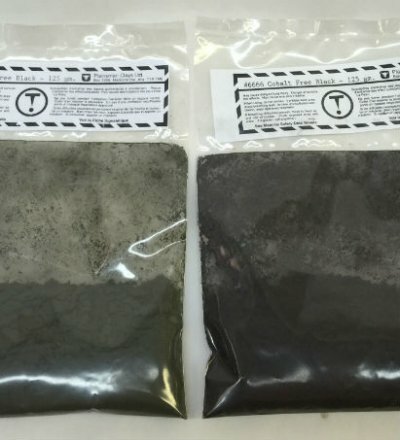 Stain companies make adjustments when they receive shipment of off-standard raw colorants, this insulates the end user from fired variations in color. In this case, they added extra chrome (to the one on the left), the final product produces the same colored black glaze. Blue specks in a pugged porcelain. Be careful when adding stain. This is the cut-line on a wet, plastic slug of porcelain. These specks are agglomerates of a blue stain and existed even though the porcelain was dispersed under a powerful slurry mixer for ten minutes. 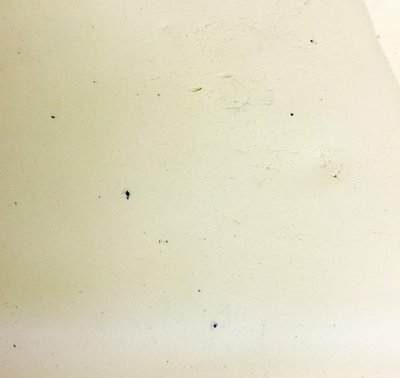 Pure cobalt, if used to stain a porcelain, is known to do this. So stain is often used as an alternative. Some stains disperse much better than others (and do not agglomerate like this). The lesson is to test the colors of the stain available to you to make sure and use one that does disperse well. On the left is a pure blue stain, on the right a green one. Obviously, the green is much more refractory. On the other hand, the green just sits on the surface as a dry, unmelted layer. For this type of work, stains need to be mixed into a glaze-like recipe of compatible chemistry (a medium) to create a good, paintable color. The blue is powerful, it would only need to comprise 5-10% of the recipe total. Its medium would need to have a stiffer melt (so the cobalt fluxes it to the desired degree of melt fluidity). A higher percentage of the green stain is needed, perhaps double. It's medium needs much more melt fluidity since the stain is refractory. Of course, only repeated testing would get them just right. Guidelines of the stain manufacturer for chemistry compatibility need to be consulted also (as certain stains will not develop their color unless their glaze medium host has a compatible chemistry). And, to be as paintable as possible, use use a gum-solution/water mix (e.g. 2 parts water to one part gum solution). 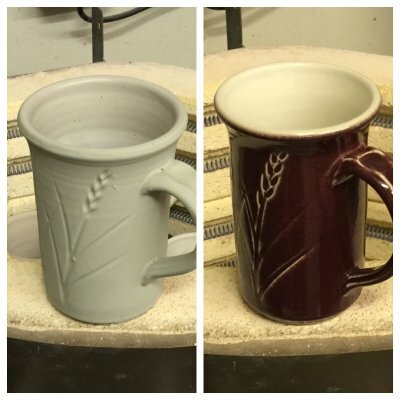 Maroon and white mug before and after firing: What a difference! The outer glaze is Ravenscrag GR6-E Raspberry, the bright maroon color is a product of the surprising interaction between the 0.5% chrome oxide and 7.5% tin oxide present. That small amount of chrome is only enough to give the raw powder a slight greenish hue, hardly different than the clear liner. While this color mechanism appears to be effective, it is delicate. A maroon stain is actually a better choice. It would fire more consistent would be less hazardous to use. And the raw glaze will be the same color as the fired one! Stains added to a base glaze can change its melt fluidity. Adjust the base. 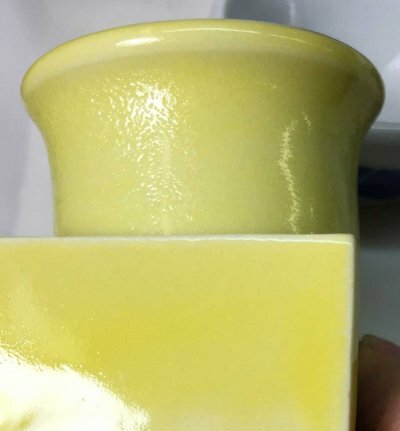 At the top is a melt-flow GBMF test ball of a cone 6 satin matte glaze, G2934. Left bottom: 8% 6213 Mason Hemlock green stain added. The color is good but it is not melting as much and the surface is more matte. A solution is to adjust the base: employ a 90:10 or 80:20 matte:glossy blend to give it better fluidity. Right bottom: 8% 6385 Mason Pansy Purple stain added. The percentage of stain appears to be a little low and its surface is a little too matte. Again, blend a some glossy clear in the the matte base to shine it up a little. This is happening on five different stains at 8% concentrations. The body: A fritted porcelain. Temperature: Cone 03. The glaze: 85% frit. The solution? Documentation for inclusion frits notes that adding 2-3% zircon can brighten the color. Although this does not seem intuitive, we added 2% anyway and refired another sample. You can see the dramatic difference on that tile below. The color is brighter because the micro-bubble clouds that were diffusing it are gone! Of course, it is apparent that the percentage of stain also needs to be increased to get more intense color. What happened to the bubbles? It could be that the particles of zircon that float, unmelted in the glaze melt, act as seed-points for bubble agglomeration and the bigger bubbles then break the surface and it heals behind them. But where do the bubbles come from? I do not know. Left: The outside is unglazed, the inside is a transparent. Mason 6300 stain. 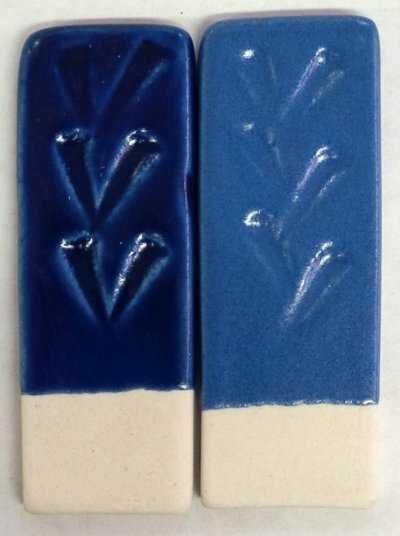 On the right is the same body overglazed with Alberta Slip floating blue (GA6-C). The cone 03 porcelain cup on the left has 10% Cerdec encapsulated stain 239416 in the G2931K clear base. The surface is orange-peeled because the glass is full of micro-bubbles that developed during the firing. Notice that the insides of the cups are crystal-clear, no bubbles. So here they are a direct product of the presence of the stain. The glaze on the right has even more stain, 15%. But it also has a 3% addition of zircon. Suppliers of encapsulated stains recommend a zircon addition, but are often unclear about why. Here is the reason, it is a "fining agent". Stain-based black engobe is clean to use! Stains are fired, inert particles of a relatively large ultimate size. Unlike that, raw oxide powders, like iron or manganese, have much finer sizes and are thus extremely dirty to use. 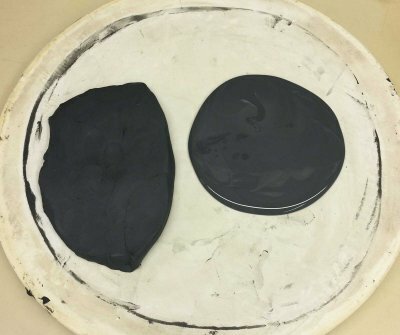 This plaster slab is being used to dewater these 15% black engobes for shrinkage testing. The slurry on the right has just been poured, the one on the left has just been peeled up (it was spread across almost the entire surface). Notice it has left no stain (the marks on the outer edge wash off easily). What does this mean? It means that using this engobe is much, much cleaner than using a body or slip colored using raw or burnt umber, iron, manganese or cobalt. 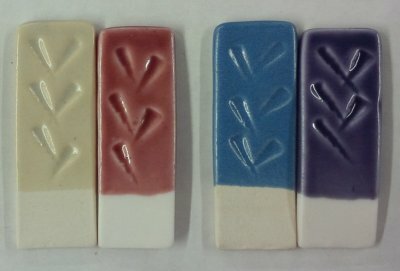 These are G2926B clear glazes with stains added and fired at cone 6. The one on the left has 11% Mason 6021 encapsulated red. It is pebbling the surface (even with 2% zircon), it may be at the upper end of its firing range. Possible solutions are faster firing up and down to give the stain less chance to decompose. A lower percentage might help, that would impart a bit of variation where it is thicker and thinner (like the purple one) to add visual interest. A different host glaze, perhaps one with less boron might work better. 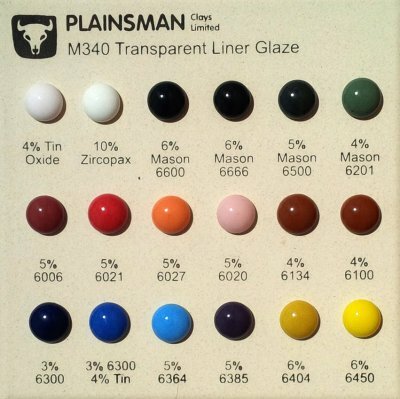 The purple one has 10% Mason 6304, it is not affecting the glossy glaze surface. But the percentage needs to be higher to prevent the wash-out of color where it is applied thinner. A complete discussion of how ceramic pigments and stains are manufactured and used in the tile industry. It includes theory, types, colors, opacification, processing, particles size, testing information. This device to measure glaze melt fluidity helps you better understand your glazes and materials and solve all sorts of problems.